Use categories and tags to make it easier for your customers to find what they are looking for. 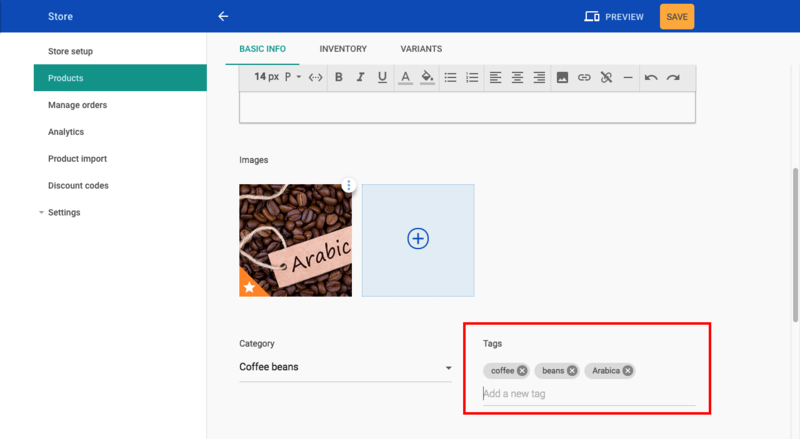 What's the difference between categories and tags? A category is for a high-level grouping of related products. For example, if you sell clothes, you might create categories for "Men's", "Women's" and "Children's" clothes. A tag makes a product easier to find by adding words that a visitor to your site might use when searching. For example, someone searching for a shirt might type "Shirt", "Tshirt", "Tee Shirt", "T-shirt". A product can only have one category but it can have any number of tags. Products that are tagged can be shown as a single group of products on any page on your site using Featured products. On the product page, scroll down until you see the Category field. Select Add new... from the drop-down menu and type a category name. There is no limit to the number of categories you can add, but each product can only have one category.